The first formal settlement in South Africa was established when Jan van Riebeeck landed at the Cape of Good Hope in 1652 and set up a refreshment station for ships of the Dutch East India Company sailing between Europe and the Indies. This was the origin of the city, the current legislative capital of South Africa and provincial capital of the Western Cape. Prior to the adoption of the recent logo-type symbols for Cape Town, the flags of the City were more heraldic in nature being derived from the oldest civic coat of arms in South Africa which were granted to the "Community of Cape Town" by the Commissioner General of the Batavian Republic, AJ de Mist, in the form of a seal, on 12 June 1804. 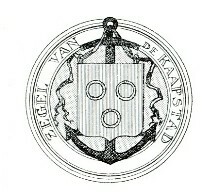 This seal comprised the shield of arms of Jan van Riebeeck, namely: Gules, three annulets Or, surmounting a black anchor with a riband through the ring, within the circumscription "ZEGEL VAN DE KAAPSTAD". After nearly 150 years in Dutch hands, the Cape was then occupied by British forces in 1795 during the Napoleonic Wars but was handed back to the Batavian Republic, as the Netherlands was then known, in 1803. It was re-occupied by British forces in 1806 and in terms of the Articles of Capitulation dated 10 January 1806, it was stated that the burghers and inhabitants retained all rights and privileges they had hitherto enjoyed. The seal of Cape Town granted in 1804, and also the arms which were an integral part of the seal, thus remained in use. It was only at the end of the 19th century that a Patent of Arms was requested from the College of Arms in London. This Patent, dated 29 December 1899, confirmed the essence of the grant by de Mist, but augmented the arms with the addition of a helmet, crest, mantling, supporters and a motto. These arms were later registered, unchanged, by the South African Bureau of Heraldry on 06 January 1972. The City of Cape Town has a new civic flag based on its new logo. The new corporate identity and pay-off line was announced on 27 February 2014. It was developed to express the strategic shift of the City from passive service delivery to shared responsibility for mutual success. According to a spokesperson for the City, “the refreshed identity and pay-off-line speaks to a City that is working towards empowering its diverse citizens to make the most of the opportunities and help that we provide to enable them to take control of their lives. It is aligned to our vision that speaks to achieving greatness through collaboration and sharing in the spirit of progress. Relevance – the identity is demonstrating relevance by being uniquely Cape Town, from the repetition of Table Mountain to choosing our vibrant colour spectrum that reflects the energy and spirit of the people that call this city home. Warmth – the circular shape infers the coming together of communities, the outer shape holding us together, demonstrating our caring nature. It represents our inclusive nature: government, residents and the public sector working in collaboration. Gravitas – gravitas is implied by the overall balance and symmetry of the symbol. The abstract nature allows it to both reveal the multiple Table Mountains whilst also retaining the strength of a crest. It is this crest-like form that gives the symbol its feeling of importance and strength. Simplicity – the new identity addresses the challenges of the previous identity by simplifying in the following ways: there is increased clarity of the overall structure and interplay in colour application across different executions; it is less fragile than the previous version when reduced in size or applied in monochrome; it is designed to stretch well across the Brand Architecture continuum, addressing the needs of Transport for Cape Town and other directorate descriptors. Freshness – the new identity breathes life into our brand strategy by using fresh, bright colours. Through the clever use of Table Mountain we have contemporised an iconic landmark. It is striking, vibrant and distinctive to other marks in the landscape. Opportunity – the circular shape speaks to the explosion of opportunities that we provide and the fact that with opportunity comes possibility. The inherit message is that there is chance for advancement, but it requires action to be taken. Progress – the shape speaks to dynamism and movement. When all role-players play their part there is a sense of moving forward, the sense that things are getting better because we are working collaboratively for mutual success. Shared Responsibility – the layers visually express the coming together of all stakeholders, of us working in harmony to ensure progress. As a City we make it possible; as an individual, business or partner, you make it happen. Inclusivity – the colours and layered shapes speak to the diversity of our communities, cultures and religions. It requires everyone to get involved, be active and make the most of the opportunities we provide because making progress possible is a shared responsibility”. The new municipal flag replaces that which was adopted in 2004 and comprises the new City logo and pay-off line on a white background. While initially following the adoption of the new municipal logo, the new municipal flag simply featured the new logo on a white background between 2003 and 2004, subsequently flags have been made featuring the logo with the name of the city and its slogan on a white field with a yellow border. The new City of Cape Town Metropolitan Council, one of six metropolitan councils formed following the re-organisation of South African local authorities in December 2000, is an amalgamation of the former municipalities of Blaauwberg, Cape Town, Tygerberg, Helderberg, Oostenberg, and South Peninsula (Fish Hoek, Simsonstown and Muizenberg). On 27 August 2003 a new logo design was chosen to form the basis of the visual identity for the Cape Town metropolitan council. The logo bears a brush stroke outline of Table Mountain against a backdrop of South African flag-coloured brush strokes with the name of the City in the most prominent languages used in the area, namely English, isiXhosa and Afrikaans, underneath. This logo, again, formed the basis for another new flag used by the City of Cape Town. The symbolism of the new logo is directly related to the notion of the South African "rainbow nation" and its connotations with diversity and unity. This symbolism is carried forward in a more recent refinement in the design of the municipal logo. Though the logo is not an image of a real rainbow, it again draws its colours from the national flag and this in turn demonstrates Cape Town's linkages and role within the greater South African context. Table Mountain is the central symbol that is accepted as representing the City both within South Africa and overseas. Cape Town was the first local municipality in the transitional period (between April 1994 and December 2000) to replace its formal coat of arms in use since 1899 with a logo. This logo was designed by a graphic artist and was chosen in July 1997 from 140 entries received in a competition and formed the basis of a new municipal flag. This flag had a stylised image of Table Mountain, the most well known landmark in the city, in white on a mainly blue field extending from the hoist, a green rectangle against the fly, and a red base throughout. Below the Table Mountain image is a yellow "brush stroke" horizontal stripe which separates the red base from the blue and green. The white outline of the mountain hinted at the famous cloud "table-cloth" which sometimes covers Table Mountain, the blue band stood for the unpolluted sky and oceans and the green for the lush, natural environment of Cape Town. The vibrant city lying in the shadow of Table Mountain was symbolised by the red band and the yellow dash was characteristic of the cosmopolitan nature of the inhabitants of the city. It was said that the bright colours and more informal feel epitomised the progressive nature of the city and its people. You have a flag of that ghastly squiggle logo that represents Table Mountain. I saw two examples of different squiggles (both representing the mountain) when I was down in Cape Town about 2 years ago. I saw neither on a flag - both were on boards. One of the two logos was for the Greater Cape Metropolitan Council (covering the entire Cape Peninsula except for the nature reserve at the southern tip, the Cape Flats, Somerset West, Strand, Gordon's Bay, the Tygerberg area and the areas on the north shore of Table Bay) and the other for the Cape Town Municipality (a sub-metropolitan regional council covering the so-called City Bowl, the southern suburbs near the mountain down as far as Wynberg, and the Atlantic seaboard, I think including Hout Bay). I can't recall which logo was which - the drawbacks of trendy design! But my reason for writing is that in the 1960s, 1970s and 1980s there was a navy blue or royal blue flag bearing the arms of Cape Town: a gold shield bearing an anchor, with a red inescutcheon bearing three annulets. I couldn't quote you the dimensions off-hand, but it was regularly flown at municipal congresses. The Coat of Arms can be found on this site. The City of Cape Town has also adopted a new flag to replace that based on the municipal Arms. The new flag has a stylised image of Table Mountain in white on a background of blue in the top left half and green on the top right hand corners. Below the Table Mountain image is a yellow "paint brush" horizontal stripe under which is a red stripe at the bottom of the flag. Like the flag of the Cape Metropolitan Council, the flag was designed by a graphic artist. Uniquely in Southern Africa, the flag is the now main symbol used by the municipality since no new arms for the city have yet been adopted. Like the flag of the Cape Town Metropolitan Council, this flag has also not been registered with the Bureau of Heraldry. The former flag of the City of Cape Town had a blue field in the centre of which was the municipal arms, described by Dr Cor Pama, as comprising a "blue field with the old arms, as granted by de Mist, in the middle". No specific date of adoption is provided. MOTTO: SPES BONA (Good Hope). It was some years after the granting of the arms by the College of Arms that the City Council also adopted a municipal flag that had a blue field with the original arms (seal), as granted by Commissioner-General De Mist, in the centre. (There is an illustration of this flag in Lions and Virgins by Dr. C Pama). This flag was used until a new flag was adopted by the new Cape Town Metropolitan Council following the re-organisation of local government in South Africa in 1997. With the introduction of the new flag, Cape Town is unique in South Africa in that no new arms have yet been adopted although those described above are no longer used. Another civic flag was in use on the Cape Peninsula between 1995 and December 2000 when the municipalities of the City of Cape Town, Blaauwberg, Helderberg, Oostenberg, South Peninsula and Tygerberg formed the Cape Metropolitan Council during the transitional period (not to be confused with the post-2000 Cape Town Metropolitan Municipality). The Cape Metropolitan Council adopted a logo in August 1996 to promote a fresh identity for the organisation. The design of the logo was chosen after 48 designers were invited to submit designs. The winning design was selected from a short-list of 12 and took the form of a stylised Table Mountain with an outline of the coastline of the Peninsula and Cape Metro area below. The colours of the emblem blend from dark green, light green, white through to almost purple and to green again. Six purple horizontal lines bisect the lower half of the emblem representing the six municipalities that formed the metro. This logo also formed the basis of a flag for the Cape Metro Council. For ease of manufacture, the colours of the logo on the flag were simplified to grey, dark blue, green and white and the name of the Council was omitted. The head office of the Cape Metropolitan Council was in Cape Town which is symbolised by Table Mountain. Its area of jurisdiction was shown by the stylised coastline of the Cape Peninsula and the curved shape symbolises the encapsulation of the new metropolitan area. The light reflecting in the water was to show the confidence in the future of the Cape. This flag and logo also ceased to be used after 05 December 2000 following the establishment of the City of Cape Town in terms of the new local government legislation. WITH THE AUTUMNAL SUN glinting on the City Hall portals, four men in colourful period costume set off on a march through the city's streets carrying the Cape Town Festival armorial bearings. This daily Festival ritual starts at 9 am. Helmut Otto (standard bearer), Peter Hamblin (drummer), Rainie Strydom (trumpeter on left) and Graham Coote (trumpeter) descend the City Hall steps. The banner was specially devised for the festival of that year and was also hung from street poles. It takes the lion supporter from the city arms and makes it a banner bearer within the banner; the small banner being the contents of the shield in the arms granted to the city in 1899 by the College of Arms. (See http://uk.geocities.com/armoria/muni/CapeTown.html). I don't yet have an image of the flag used by Cape Town in that period, but it was principally blue, and if I recall correctly it had a shield of the arms offset to the hoist. The blue in the city flag was darker than the blue this banner, though. The lion's tongue is a much paler blue, and the claws, which in the armorial achievement should also be blue, are shown as white, no doubt because of the blue background behind the red lion, a clear breach of the colour rule. The edging is in black and yellow – the black taken from the colour of the anchor. The anchor was the common feature (as a single supporter) in the civic arms granted in 1804 by Commissioner-General Jacob Abraham Uitenhage de Mist (see http://uk.geocities.com/armoria/DCs/dist_auth.html#anchor).